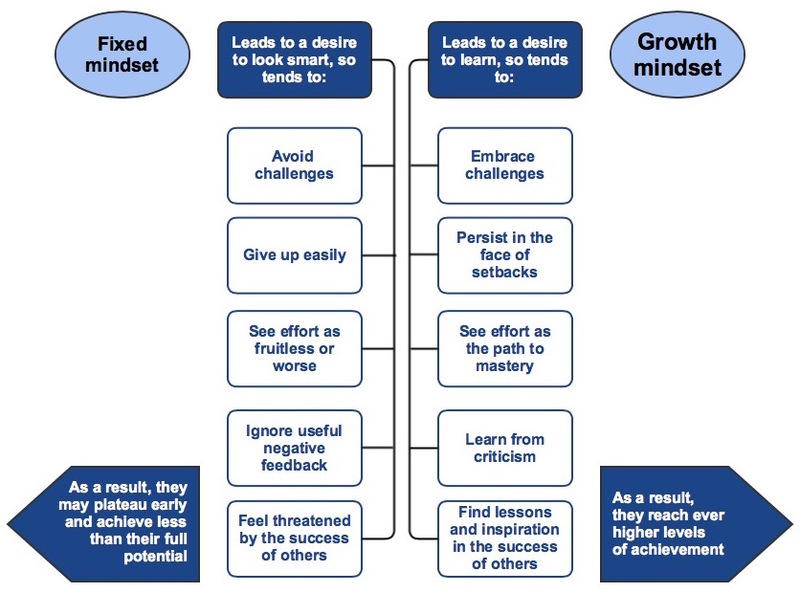 Carole Dweck’s work on mindset in learning (Mindsets and Math/Science Achievement, 2008) has found that students with a fixed mindset (those who believed achievements are based on talent) performed less well than students with a growth mindset (who believe achievements are based on effort and support). It follows that learners’ mindsets must be changed from ‘I can’t do maths/English’ to ‘I can’t do maths/English yet’ before they are likely to progress in their learning. This is particularly important when dealing with learners re-taking GCSEs, who are likely to have a history of failure in maths and/or English and a lack of self-belief. For maths in particular, many young people have developed ‘maladaptive beliefs’ about learning maths and their own abilities, which can contribute both to poor engagement and low achievement. Extensive research has been conducted on challenging maladaptive beliefs about maths (e.g. Boaler Ability and Mathematics: the mindset revolution that is reshaping education, 2013). This research includes work on changing mindsets, reducing maths anxiety and promoting ‘mathematical resilience‘. Stanford professor Jo Boaler has her own youcubed website dedicated to promoting mathematical mindsets and more visual approaches to maths learning. The site includes a series of short videos containing ‘boosting maths messages‘ for students. Related to this work, the Education and Training Foundation offer CPD modules which introduce ideas of mathematical resilience and resilience in English learning, with follow up modules which employ coaching skills to develop learner’s resilience. Download a PDF version of these questions here.